About us | Hostel "Kanonia"
Looking for accommodations in the heart of Warsaw? Look no further – Kanonia is a cozy and atmospheric hostel that allows you to enjoy all the splendor of Warsaw while ensuring blissful relaxation. We assure you that you’ve come to the right place! Kanonia Hostel opened in 2004 and became a unique place on the map of Warsaw, wrapped in an artistic atmosphere. It is a charming hostel with soul and character, located in Warsaw’s Old Town, and enhanced by extraordinary decor and colorful interiors. It is also the only hostel in the Warsaw’s Old Town where history is intertwined with modernity. Our rooms have a magnificent view of Kanonia Square, with its historic bell, narrowest house in Europe, and Jezuicka Street facing the back of St. Jan Cathedral. Kanonia Square was the inspiration for the name of our hostel, not only because of its adjacent location, but also because we wanted to draw attention to the charm of the less popular corners of the capital. In 1406, the Canonry of the Warsaw Chapter received a plot in Kanonia square and built tall, narrow wooden houses. After a fire broke out in 1607, the houses had to be rebuilt using bricks. For some time, three houses purchased by Priest Stanisław Staszic served as the headquarters for the Friends of Science Society. Residing in these houses was the Archbishop of Warsaw – Jan Paweł Woronicz, and the author of poems and legends of Warsaw – Arthur Oppman, known under the pseudonym Or-Ot. Kanonia, along with the entire Old Town, was destroyed in 1944. After the reconstruction, they created the extremely narrow house in the square that is now a famous tourist attraction. Kanonia is peace and comfort in a vibrant capital city! The location of our hostel makes it an ideal place for a romantic weekend just for two, a business stay, an unforgettable trip with friends, or a successful holiday with the whole family. Hostel Kanonia is located only 200 metres from the Royal Castle, and 50 metres from the charming Old Town square. 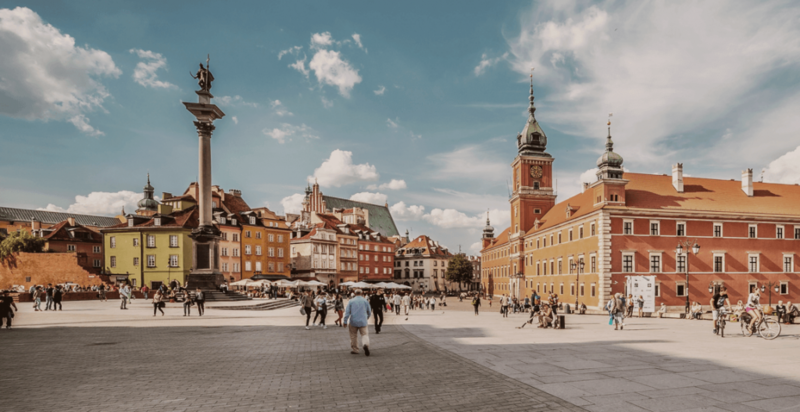 Besides the many historic sights, the area around the hostel also contains a lot of restaurants and atmospheric pubs serving regional delicacies and traditional Polish dishes. The closeness of major tourist attractions makes it impossible for you to get bored during you stay. Although our hostel is located in the center of Warsaw, it is inspired by unconventional, sophisticated taste, artistic energy, good atmosphere and human kindness.